And here is the full piece. You can see that I have stitched a good chunk of Block 10 too. I want to complete 10 in September so I can dedicate October to Hallowe'en stitching. The Donna Kooler Tinies have all been FFO'd and once my friend gives me permission I can show them on here. Should be viewable for next month's Smalls Post. Finally, Blogger has a new glitsch to delight and entertain us all. Specially selected commenters can no longer comment on blogs where the comment field is embedded. They can only comment on blogs where the comment field is a pop-up. So if you like to get comments - go into your Dashboard and change your comment field to a Pop-up. Chatter is restored! Thanks to Brigitte for alerting me to this latest vagary of Blogger. Gorgeous stitching! Thanks for the info about comments. Thanks, Jo, I just realised this on another friend's blog - I commented successfully the other day but no luck today! Great work on your smalls and I love your Decision Wheel! I love all of your smalls. IT is always a delight to see what we are all up to. I knew there was a problem with blogger. I have been having a bear of a time. I had decided it must be a glitch in the browser I used. I use Safari. But now that you have said this...I have only been able to comment on the pop ups. Seriously, Blogger is trying to do me in. Thank you, Jo, for changing the comment section to the pop-up window. Now I can comment on your blog as usual. And as you know I like commenting :)) Some months ago there was the same problem but they fixed it very fast. This time it has been going on for more than two weeks already. It's such a pain with Blogger. Your 12 Days will soon be done and I'm in awe of your organizing talent. I haven't stitched in quite a while, my mojo has disappeared as it happens always in summer. I hope it will return soon. Congrats on all of the cute finishes Jo. Looking good, did you finish ten yet? Sweet smalls, such pretty colours. What a fun wheel, I might have to try that for next year. 12 Days is looking great! Beautiful stitching. I've seen a few people using this random wheel. Cute idea. I always just give Jeremiah numbers and make him pick. Then I get mad at whatever he picks haha. Thanks for letting me know about the comment thing. I thought my comments looked lower than usual. I always love seeing your Smalls. In particular, I love your 12 Days, which is looking gorgeous. 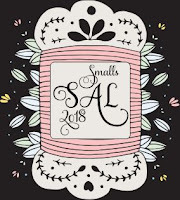 Lovely smalls and a cool app! I like randomizing stuff. I usually just enumerate options and use random.org to pick one, but the wheel looks much fancier!